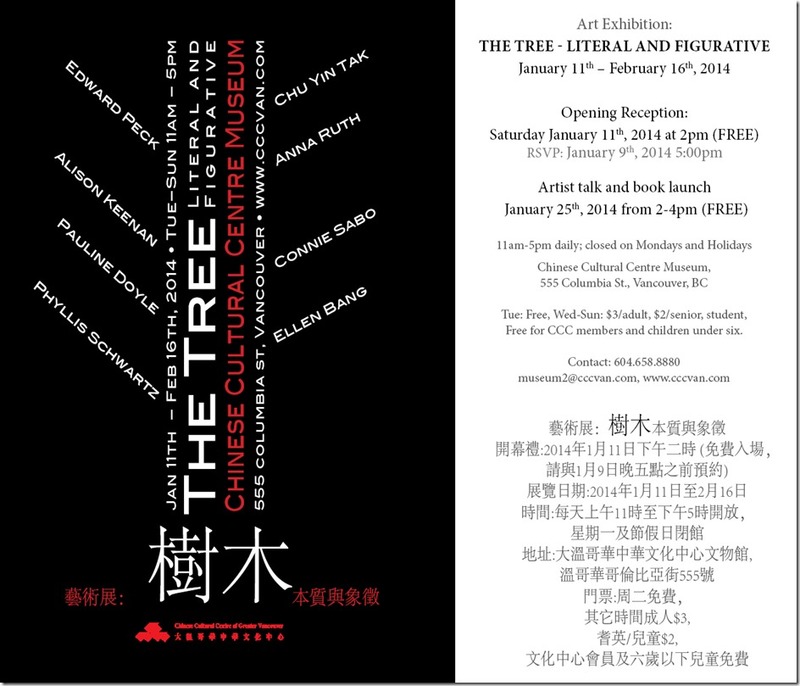 Chinese Cultural Centre and Best B4 Collective are excited to invite you art exhibition: The Tree: Literal and Figurative curated by Alison Keenan and Phyllis Schwartz. Eight international artists, each working in a different media have work that will surely evoke myriad myths and memories about the tree. Exhibiting artists include Ellen Bang, Chu Yin Tak, Pauline Doyle, Alison Keenan, Edward Peck, Anna Ruth, Connie Sabo and Phyllis Schwartz. Hours of Opening: Tuesday –Sunday, 11 am-5pm. Admission is free on Tuesdays. Wed-Sun $3/adult, $2/senior, student.